How Come No One Calls Out Pandora For False Promise Of Profitability? Adam Singer has the news of how a reporter for CBS News, reporting on the Grammys, posted a YouTube clip to a story he had written... except soon after it was posted, CBS issued a DMCA takedown on the video, leading to this bizarre situation, put into image form by someone at Reddit (of course): Both reports claim that this is CBS filing copyright claims against itself, though that's not really accurate. It's CBS filing a YouTube takedown (or doing a content ID match, more likely) and not realizing that its own reporters were making use of the YouTube video. 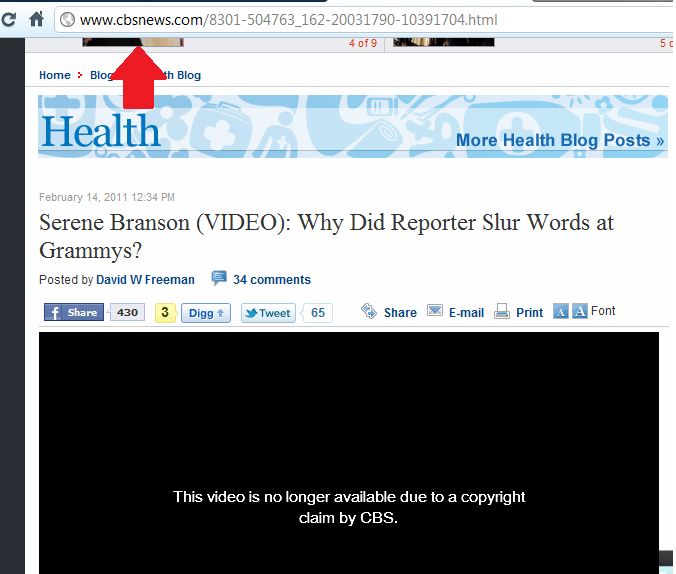 The real question is why CBS wouldn't make legit clips available as easily as the YouTube clips were available. As it stands now, the video embed has been pulled down, and the reporter apologizes that no clips are available. That scenario seems even more ridiculous than the original takedown. This is the same company, and he can't get a legit clip to put with the story?